Of all the upsides to flying across the ocean to ski at a large interconnected resort in the Alps, the most compelling reason for North Americans is being able to base yourself for a solid week at one hotel and discover its extensive lift-served riches at your own pace. At the same time, with so many mountains in close proximity, the nomad format – hopping around from one monster circuit to the next – has its advantages as well. You get a lot of variety in a short period of time and can easily compare and contrast the differences between one region and the next: a tasting menu of sorts. Following my previous year’s visit to Austria’s Vorarlberg, I decided to mix things up culturally and head back across the pond on a late-January visit to a francophone ski region. That said; given the number of resorts in the French part of the mountain range (approximately 150), it can be a daunting task to narrow down your options. Do you lean toward the most skiable acres, the highest altitude, the most annual snow, the most old-school, the most challenging, the most modern, the most-off-the-beaten-path, the most authentically French, the most affordable, or the most conveniently located to a gateway airport? I ultimately opted for a road trip that put a partial premium on the last variable and constructed a eight-day whirlwind visit through four separate ski regions in the Haute Savoie region, all within a 90-minute drive of Geneva, Switzerland. With nonstop overnight flights from JFK, Newark, Boston, or Montreal, it’s possible for northeasterners to design a ski trip with less logistical hurdles than many popular destinations out west. After picking up my luggage and renting a car – a Peugeot with a stick shift, that’s what you get in Europe unless you specifically reserve an automatic transmission – the trip kicked off with a return visit to the massive Portes du Soleil (“Gateway to the Sun”) region that I’d enjoyed two years earlier. 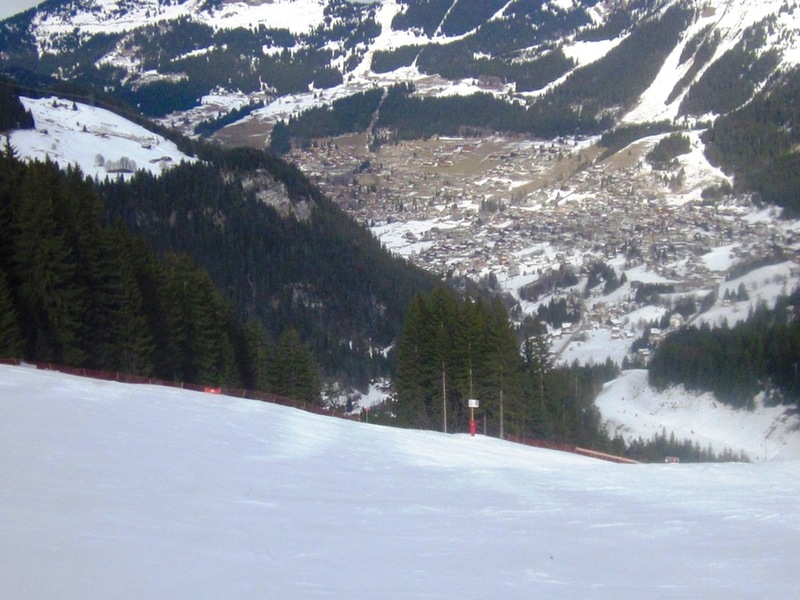 Even after seven bell-to-bell days while being based in the pleasant family-friendly villages of Les Gets and Morzine, it felt like I’d only scratched the surface of the more than 250 miles of marked trails and vast amounts of offpiste. For this visit, I opted to headquarter myself at the other end of the circuit in the animated village of Châtel, 11 miles away as the crow flies (as a comparison, Vail from end-to-end is six miles wide). With about 1,200 inhabitants, Châtel is modest in size but chock full of restaurants, bars, shops, a cinema, a popular water park, lots of reasonably-priced lodging, and a short 70-minute drive from the airport. Most important for skiers, the village is well positioned amongst the main Portes du Soleil circuit with easy access to both wooded and wide open slopes including higher-elevation Avoriaz (featuring more annual snow than any other French ski area) and the gorgeous south-facing Swiss sectors, all of which you can navigate in either direction, while taking in breathtaking views of the Dents du Midi. While the marked trails are skewed predominantly toward intermediate, there are piles of enjoyable challenging options away from the groomers. 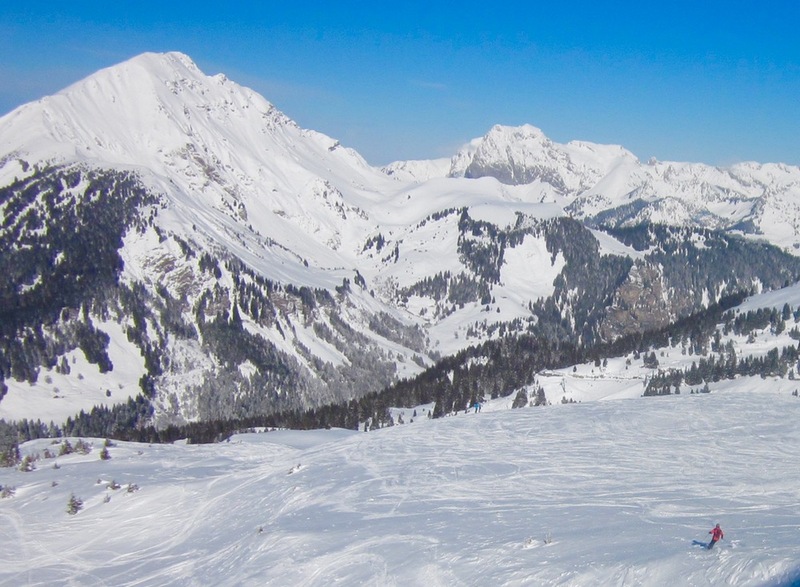 And if you’re trying to avoid weekend or holiday crowds, unconnected off-the-beaten-path ski areas Abondance, Chapelle d’Abondance, and Roc d’Enfer are close by. 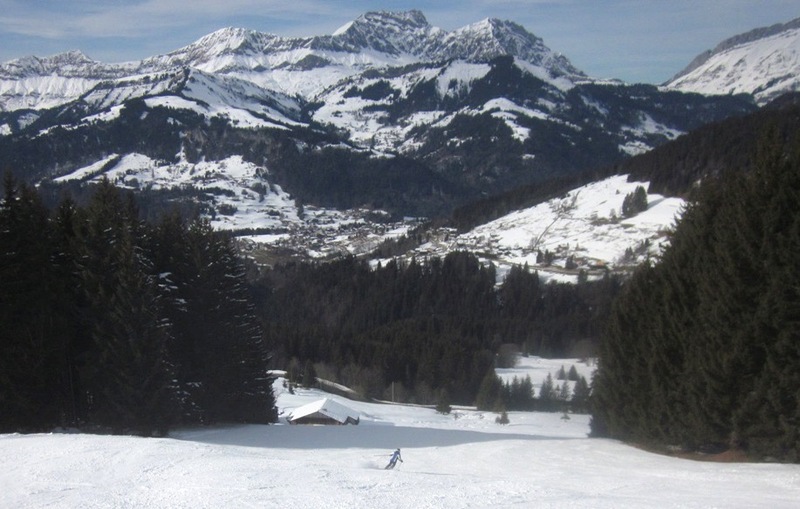 The disadvantage to the Portes du Soleil (actually to all of the regions on this visit) is that it’s at a comparatively low elevation and subject to occasionally variable conditions. After getting pummeled by snow over the first three weeks of January, there’d been an unfortunately-timed Alps-wide thaw/refreeze cycle just before my arrival that left conditions scratchy; ungroomed terrain was unfortunately a no-go. Still, even with conditions being far from optimum, being able to travel on skis over long distances, gape at stunning scenery, and stop at atmospheric on-mountain restaurants with excellent cuisine was a great way to kick off a week-long vacation. In addition to its other attributes, Châtel’s secret sauce is being at the head of the agricultural Abondance Valley boasting more than 40 working farms, giving the area a more authentic feeling than many ski resorts in the French Alps. I took advantage of this feature to go on a late-afternoon visit to a nearby dairy farm and get a step-by-step tour of how they make the region’s renowned eponymous cheese from a couple dozen cows, most sporting a trademark imprint around their eyes that looks like they’re wearing sunglasses. After running back to Geneva airport in the early morning to pick up my wife who’d flown in on the same overnight flight to Geneva that I’d taken two days earlier, we zipped an hour south to a ski region based around a pair of traditional villages exuding rustic charm and authentic French atmosphere; each with its own interconnected circuit that added up to 125 miles of varied terrain. By the time we pulled into the village of Grand Bornand (“Grand Bo” to locals) late morning, the thick low clouds had lifted and the sun came out. We later learned that the clientele for both Grand Bornand and La Clusaz continues to be predominately French in contrast to many resorts that have been partially or extensively colonised by tourists from other countries. It proudly keeps its Gallic roots and agricultural life at the forefront with an extensive farmer’s market every Wednesday morning. 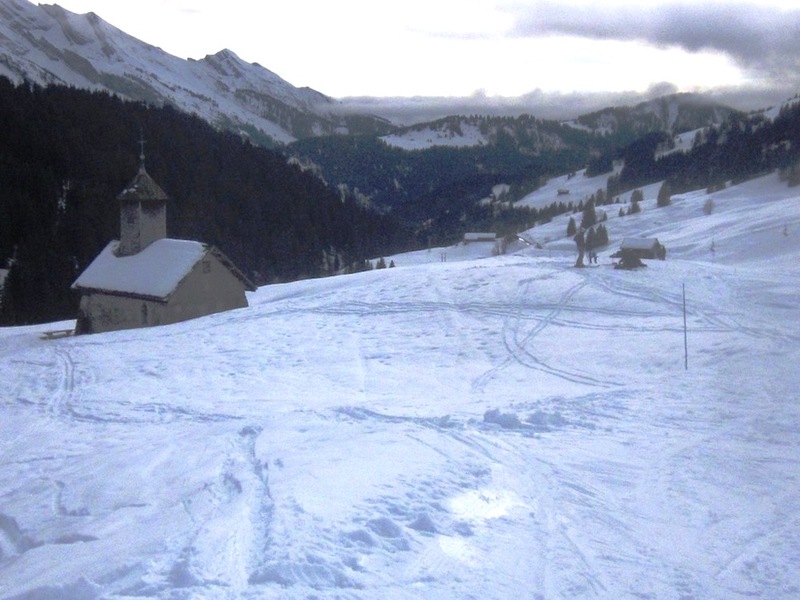 Although Grand Bornand had gotten pounded by the previous day’s non-crystalline precipitation similar to all the other low-elevation ski areas, when we got a quarter up the mountain, things looked more than presentable. The snow had transformed into beautiful velvety sugar; there was zero ice; it was soft as could be: early April two months early. Most of the trails were rolling intermediate/upper-intermediate pitched; however, with a bit of hiking/bootpacking, it was easy to hit steeper untracked lines. The next day, we drove ten minutes to La Clusaz, a prestigious name in the French mountain world that has become better known to people on this side of the pond as the backdrop for the notorious 2013 video of superstar skier Candide Thovex: One of Those Days. 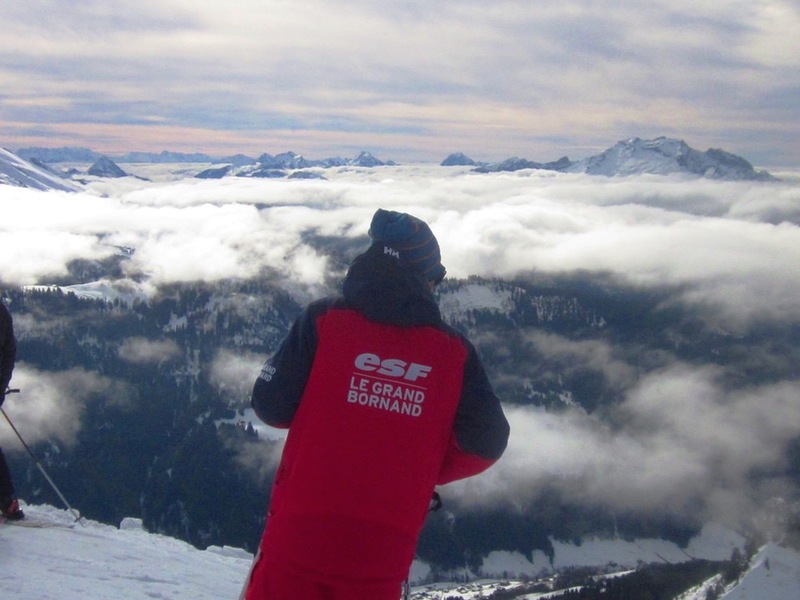 Composed of five interconnected sectors, each with its own specific niche for all levels from beginner to expert, we unfortunately only had one day to see as much as we could of the 80-mile circuit, where 18 different world ski championships had taken place. The high point of our visit was unquestionably the La Balme sector at the far end of La Clusaz, known as Candide’s “backyard.” It’s where he perfected his technique and shot “One of Those Days,” which eventually became a series of videos. The upper part of the massif is serviced exclusively by platter lifts and from top to bottom you have the incredible experience of charging down 4,600 vertical feet of spectacular terrain without any noticeable flats. 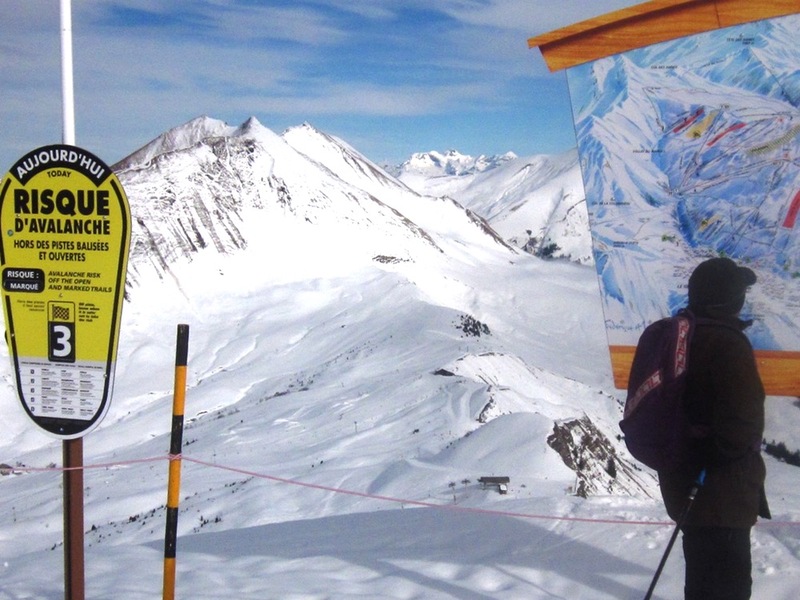 Due to the scratchy conditions that day, it wasn’t much fun to leave the groomed trails and explore the extensive off-piste, but we realised pretty quickly why La Balme has become a pilgrimage spot for experts. We finished off the day with a memorable dinner at a restaurant in the middle town called La Scierie that lived up to its name with a sawmill theme and spectacular cuisine. The next stop on our tour of Haute Savoie was Megève just to the southeast of La Clusaz, which was developed in the 1920s around a gorgeous medieval village dating back to the 14th century. Reportedly, the mega-rich Rothschild family was upset that the French didn’t have anything to rival Switzerland’s St. Moritz in the winter-wonderland department. Moreover, Baron Rothschild’s wife was uncomfortable running into Germans (the perpetrators of WWI), in Swiss resorts. For those reasons, they determinedly built France’s first purpose-built ski resort – designed to be a tantalising mixture of nature, comfort, style, and fine cuisine, which made it the traditional holiday refuge of the French aristocracy for many decades. 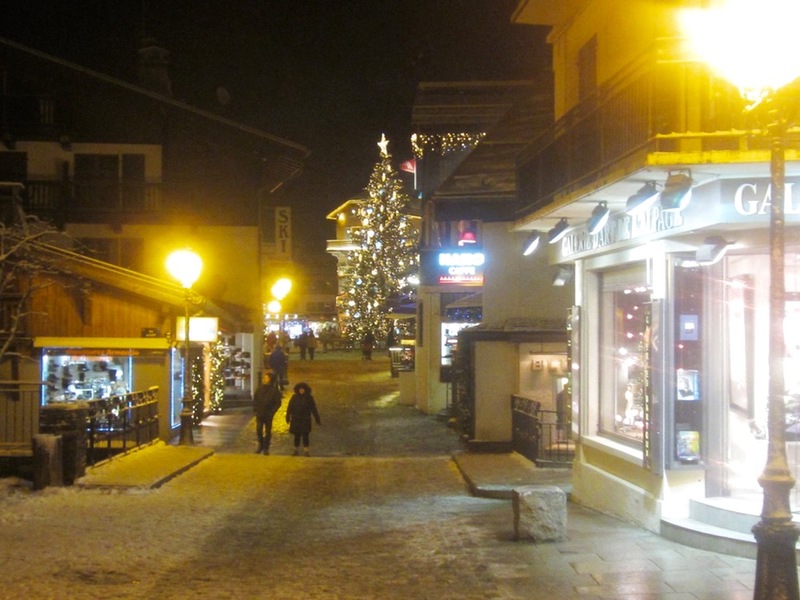 While it can be argued the 3 Vallées’ Courchevel long ago took over the title of the country’s “top resort” (whatever that means), Megève is still where the discreet old money goes: a mix of well-off French and foreigners. Calling it a European Sun Valley, Deer Valley, or Stowe is about the only ballpark comparison for Americans, but from a variety of criteria, Megève is in another stratosphere. After four days with no fresh snow, we arrived in the midst of a driving snowstorm with six inches already on the ground. Although the region isn’t far from the highest mountains in France, most of the terrain is at a comparatively low altitude, which was perfect for a day with reduced visibility so we happily stayed below the treeline in the sizable local sector. 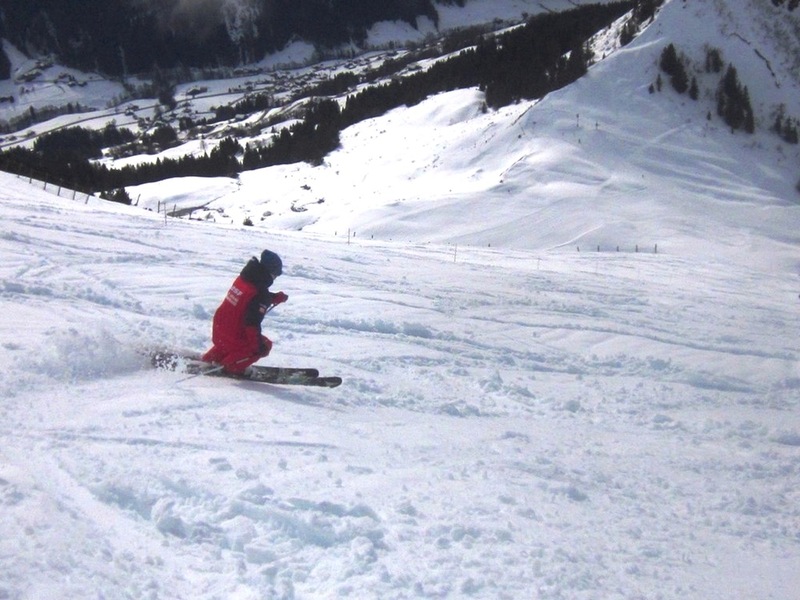 Since most of the slopes are grass-covered, you don’t need a monster base to cover the mostly upper-intermediate terrain, which is best suited for relaxed cruising with your significant other rather than challenging steeps like La Clusaz’s Balme sector. At 4 pm, we called it a day and walked through the atmospheric pedestrian village, magically dusted with fresh snow, on our way to low-key après-ski drinks near our hotel. That evening, we strolled through the cute pedestrian village, filled with upscale boutiques, restaurants, and galleries. While it’s not difficult to spend a small fortune on meals in a high-profile village like this, we also found numerous reasonable options including an excellent crêperie in front of the main lift. The following morning, we left early for a tour of the entire ski circuit, with lots of high-speed turns on trails that twisted through the trees covered in soft powder, before eventually arriving in the highest part of the interconnected ski area: above-treeline Mont Joly, where there was lots of untracked snow from the previous day’s dump. Similar to Deer Valley, most of the skiers in Megève stick to the groomers so there’s very little competition for off-piste powder. As always, stopping every couple hours for food and beverage breaks in cute mountaintop chalets is a great way to cap off the day. While two days only allowed for a quick overview of the Évasion Mont Blanc region’s 200 miles of marked trails, it was a fun visit. 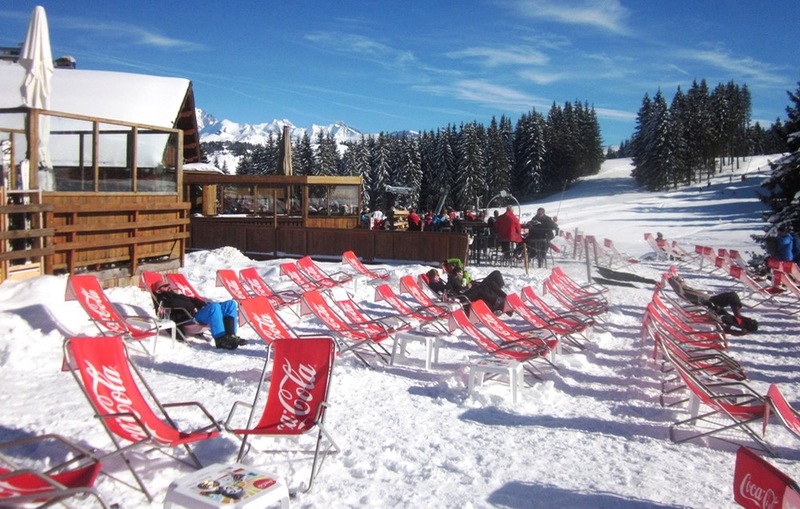 If you add the nearby Portes du Mont Blanc sector (just on the other side of Megève) with an additional 60 miles of mostly below-treeline terrain, there’s more than enough skiing here to keep you occupied for a week. For the final stop of this road trip, the Espace Diamant — roughly translated as “the Diamond Region” (it sounds better in French than in English) — we left our hotel in Megève, where an additional five inches had fallen overnight in the village with double that higher up. As the crow flies, it was a short distance to our destination, but the route between these two points took us over and through gorges, valleys, and a few villages, etc., so it was maybe a 30-minute drive. We pulled into our base for the next two days, the cute town of Crest-Voland, built around, what else, an old church. 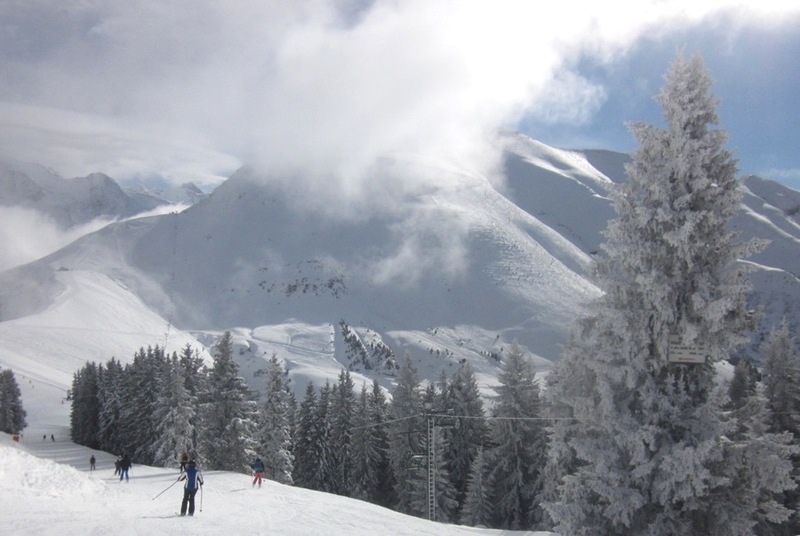 Like the other ski regions on this trip, the Espace Diamant is at a comparative low elevation for the Alps, but you’ll still find lots of above-treeline terrain. One of the cool things about this region was how many old detachable Poma drag lifts are still in use to access the many nooks and crannies hidden throughout the circuit. With 120 miles of marked trails, it’s important to get an early start to see as much as possible of the circuit as possible and on your first time there, decent navigating skills are helpful to move around efficiently. There are numerous signs reminding you not to get stuck in a far-flung part of the region at the end of the day, requiring a very costly taxi ride to get back to your accommodations. After stopping at a cute café in the village of Crest-Voland, we saw something for the first time on this trip – several dozen kids getting ready to take a group lesson, which shouldn’t have been surprising as the Espace Diamant is recognised as one of the premier family-oriented ski regions in France. Everything from restaurants to terrain to lodging, restaurants, and additional activities is designed to make things easy for groups of varied ages. Even though all of our accommodations for the past week had been pleasant, our favorite was the ski-in/ski-out Hôtel Mont Charvin featuring beautiful rustic décor throughout the dining room and bar, fantastic cuisine, and run by a very friendly couple who went out of their way to welcome families, including their first American guests in many moons. There’s something great about being in a full-service hotel where you also get to interact with the owners extensively. With ten different peaks, the region reminded us of Utah’s Canyons but more spread out and with a greater diversity of terrain, along with spectacular views of nearby Mont Blanc. In addition, you can do the circuit in both directions while stopping to enjoy a number of cute villages. According to reports, in the next five years, they’re talking about connecting Espace Diamant with Megève and eventually neighboring Les Contamines, which would surpass the 3 Vallées in trail kilometers and result in the largest interconnected ski region in the world.